Children's Hope staff with Mrs. Ma (center) on the day heater units arrived. The cold of winter and the heat of summer will no longer add to the discomfort of therapy for children at a private cerebral palsy clinic in Henan province, China. Donors provided 12 heater/air-conditioning units to heat and cool the 18 rooms of Mrs. Ma’s CP therapy clinic. The clinic treats dozens of children with CP and trains their families in therapy techniques to use at home. But because of a lack of funds, the clinic’s therapy rooms had no temperature control, so the children shivered in the winter and roasted in the summer. Mrs. Ma opened this clinic in Qinyang to help poor families like hers, when she couldn't find therapy options for her daughter who has CP. 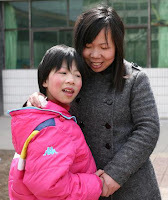 It costs Mrs. Ma over $100 per month to give therapy and boarding to one child. She has 20 children now staying at her clinic. Since the heaters are now purchased, please consider helping with a child’s therapy or a monthly donation.